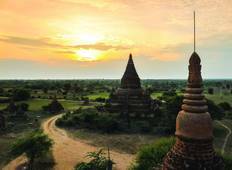 Find a Adventure trip that explores Myanmar (Burma). There are 32 tours to choose from, that range in length from 4 days up to 17 days. The most popular month for these tours is November, which has the most tour departures. "Very nice trip to see the top tourist attractions in Myanmar." "This tour gave us a greater understanding of Myanmar and the opportunity to see some..."
"Great short little tour of the main tourist parts. We booked an extra day in Bagan,..."